Crispy on the outside with a soft and fluffy centre these Italian roast potatoes are the ultimate side to any roast dinner or main course. Made with garlic cloves and fresh rosemary they're packed with flavour and pretty hard to resist. Preheat the oven to 220°C (428°F). Once the oven is at temperature pour the oil into the baking tray and place in the oven to get nice and hot. Peel the potatoes and cut them into rough medium sized chunks. When you've finished chopping the peeled potatoes the tray and oil should be nice and hot. Do the next step quickly but carefully *hot oil warning*. Bring the tray out of the oven and add the potatoes to the tray followed by the rosemary and garlic cloves. 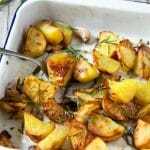 Sprinkle with salt and pepper and using a spatula or fish slice toss the potatoes to coat everything in oil and place back in the oven. Let them roast in the oven for around 25 minutes then toss so the majority of the crispy brown and golden sides are facing up. Roast again for another 20 minutes or until all the potatoes are crispy, golden brown and cooked through. Always remember to add the olive oil to the baking tray and heat it in the oven so the oil is extra hot before add your potatoes. This helps create crisp potatoes straight away. Don't use expensive extra virgin olive oil for roasting, a lesser expensive olive oil will do. If you're not serving the potatoes straight away then transfer them to a plate lined with baking parchment to drain slightly and keep warm in a low oven.